A spiral staircase (fire escape?) in one of the buildings in Ballard Estate, Mumbai. Spot the Xs in the Agarbatti(incense)stand atop Gilbert Hill. This one is for Carmen. At the Sewri mudflats in Mumbai. This one is for Priyanka. At the Juhu beach. Atop Gilbert Hill in Andheri, Mumbai. These flamingos have a new address on their cards during winter - Sewri mudflats, Mumbai. Wooden scaffolding used in construction in Mumbai. Wisdom - Some are born with it, some seek it and some have it thrust upon them! This freighter, MV Wisdom was being towed from Colombo to the ship breaking yard in Alang, Gujarat, when it broke loose and ran aground in Juhu Beach. The beached ship has become a tourist attraction! Attempts to tug it away have failed and now will be retried after a fortnight due favorable tides. The ship that drifted in to Mumbai on Juhu beach and got beached! This 9000 tonne ship was being towed from Colombo to a ship breaking yard in Alang, Gujarat when it broke loose and set adrift to get grounded on the Juhu Beach in Mumbai. 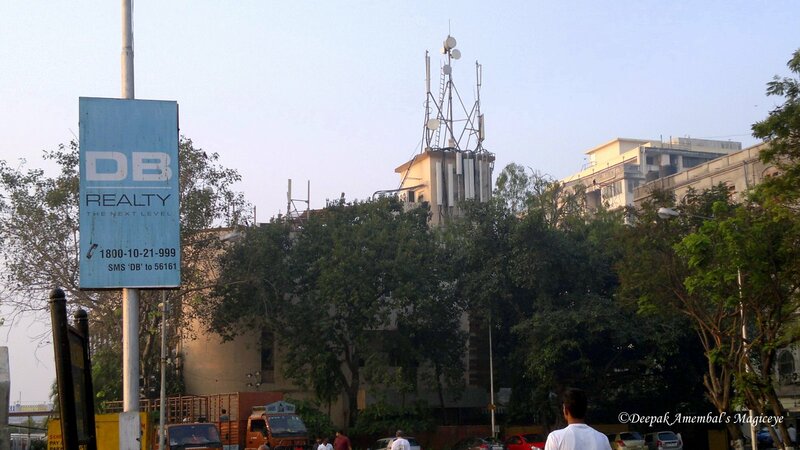 Outside Radio club in South Mumbai. P.S. The DB Realty has been in the news for all the wrong things lately. One of their Directors is behind bars for alleged fraud. The Radio Club in the background has a set of antennae which would be the core for spreading or exchanging information. 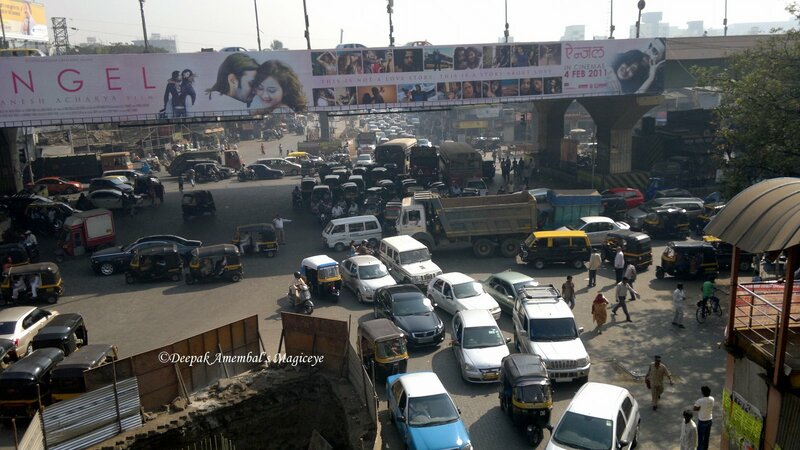 This is at the Southern end of the avenue off the Arabian sea. At the Northern end is the famed Gateway of India and the Taj Hotel. An autorickshaw splashing through a puddle of rain water in Mumbai. Spot the V? Another rainy day in Mumbai. Stark silhouette against a grey monsoon Mumbai morn. The ubiquitous Rock Pigeon of Mumbai. Baby spider(?) on a triangular leaf at Ovalekar's Butterfly Park. The dull gray Mumbai monsoon sky last evening. Young Indian classical musicians. 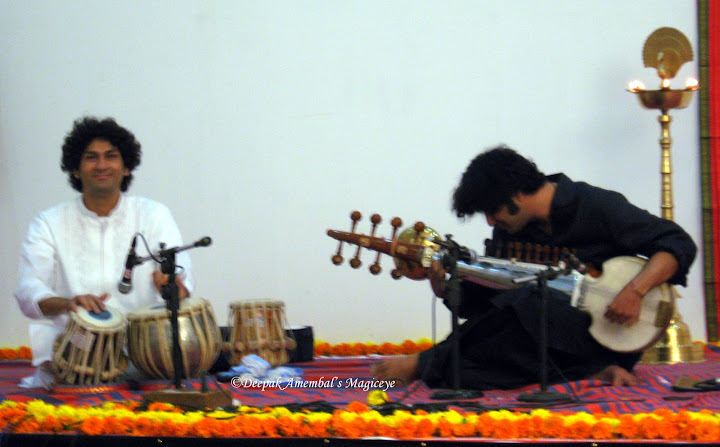 The one on the right is playing the Sarod (stringed)and the one on the left is playing the Tabla (percussion), at a concert in Mumbai. Please excuse the quality of the image. Children celebrating the rains in Mumbai. Flamingos taking flight off the Sewri mudflats in Mumbai.